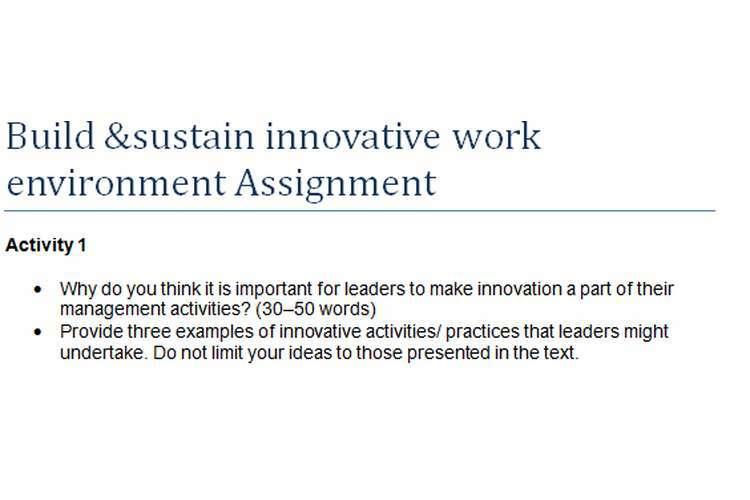 Provide three examples of innovative activities/ practices that leaders might undertake. Do not limit your ideas to those presented in the text. You are a section (departmental) manager in a large retail store. An employee has come to you to present an idea that they believe will result in improving and streamlining customer service procedures. Provide six examples of how you would respond in a bullet point list. The General Confectionery Company’s product development team have designed a new confectionery product. This product is quite different from those generally sold by the General Confectionery Company. They have conducted suitable market research to identify their target market: 5 to 8-year-old children. This means that the product needs to appeal to both the children and their parents. The company does not have the capacity to add this product to their product line without removing at least one of their other products. They will need to conduct a product analysis to identify which product/s should be removed from the list. How could you determine whether innovations fit with/ are consistent with organizational goals and objectives? Provide at least five examples. You want to determine whether your own approach to innovation is effective. How might you do this? Provide at least three examples. You do not have to limit your ideas to those presented in the text. How do good leaders build effective relationships, based on mutual respect and trust, with employees? Provide at least five examples in a bullet point list. In a bullet point list, identify at least five of the working conditions that might be introduced to encourage innovative practice. Develop, in consultation where appropriate, an innovative idea that could be applied in the organization for which you work or any other business organization. This idea need not involve major changes—small changes can often have very beneficial effects. It must, however, add value. Develop an innovative idea that would benefit from collaboration with others. The innovation will preferably relate to a work situation but if you are not currently working might relate to a personal situation. State who the stakeholders are, whether they are internal or external to the organization and why they are stakeholders; then document their responses to your ideas. What conclusions did you come to, as a result of your discussions/ collaboration? How valuable do you think the discussion with the various stakeholders is? From what sources might it be possible to gather current and emerging information that can be used to foster innovative ideas? Provide at least five examples. You might need to conduct some research of your own to determine appropriate sources. What resources should be available, to foster, promote and encourage innovation? Provide at least 10 examples in a bullet point list. You want to encourage your staff to be creative and innovative. What informal and formal learning opportunities might you provide them with to help them develop the skills needed for innovation? Provide at least five examples. What kinds of thinking or tools might individuals develop as a result of formal and informal learning opportunities? Provide at least five examples. How can individuals learn from the experience of mentors? Describe typical barriers to innovation with teams and organizations. Provide at least five examples of barriers. Do not neglect the old for the new. The existing business must not lose priority simply because an innovative idea has been suggested. Successful innovation requires support from the existing business in terms of finance and other resources. However, when assessing risk, you must take into consideration the impact the new activities are likely to have on the existing activities. One aspect of risk assessment should involve determining whether the new ideas/ improvements or innovations will prevent the already successful operations from continuing to operate at the currently accepted level. Do you consider that the organization is prepared to take risks in order to succeed? Why is the concept of risk essential to change, innovation and the marketplace success of organizations? What is the organisation’s attitude toward failure, mistakes and/or lack of success at the organizational level and the personal or individual level? How does this make employees feel with regard to making suggestions, proposing new ideas or attempting to develop new products, services or markets? How do you think mistakes should be viewed, if the organization is to proactively support innovation and change? How can frontline managers encourage and support employees so that they contribute new and innovative ideas? What kinds of work conditions and procedures are in place or should be in place to support innovation? What barriers to innovation exist within the organization? How can managers lead by example when it comes to innovation? What training or learning opportunities might be provided so that employees can develop appropriate innovation skills? Why do you think managers should regularly evaluate their own approaches for consistency with the wider organizational or project context? How does the organisation’s physical environment support innovation? How might it need to be changed? Outline any legislative framework that impacts on operations in the relevant workplace context.